Welcome to the home of CSL alumni engagement. Each Autumn and Spring, Sales Leadership graduates return to DePaul for the CSL Career Expo. Pictured above are Pepsi employees/CSL alumni who shared their insight with current job seeking students at the Expo. From left to right are PepsiCo's Mike Wojcikiewicz (Director of Category Leadership, Alexa Pierropoulos ('16), Bill DuPont ('13), and Claire Hanold ('13). Both Alexa and Claire held internships with PepsiCo while at DePaul. Great to have you back on campus, alums! Check out this feature on Sales Leadership alum Diego Chahda (BUS ’11). 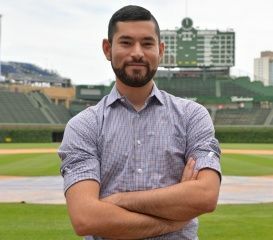 He credits his current career working with the Chicago Cubs to the skills he learned through his CSL coursework. He wanted to break into the sports business, but he had no idea how. A few people told him that ticket sales were a great entry point. There was only one problem. CSL alum and current Walgreens Category Manager, Nate B., encourages current students to utilize Center for Sales Leadership resources in their career search and beyond, taking advantage of mentoring opportunities along the way.